The centre of a medieval town was the market place. There was a well where the towns inhabitants got their water. The market place was also important. Craftsmen and merchants could sell their goods there. In the town the bourgeois lived. They could be craftsmen or merchants. All craftsmen were members of a guild. A guild was an association of all the workers in the same craft, i.e. all potters were in the same guild. Craftsmen were called masters, by them journeymen and learners were employed. The houses had gardens surrounded by buildings. 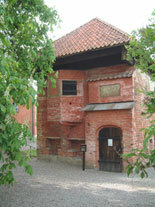 There was a store house, a brewery, a house for smoke-drying food, a cabbage garden and a herbal plot. Cows and pigs were the usual domestic animals. Inside there was just a little furniture, no curtains or wall-papers. Plates and mugs were wooden and no knives and forks were used. You ate your food with a wooden spoon or used your fingers. The only light was from the fire or from torches on the walls. This made the danger of fires quite immediate, as most houses were wooden. Only rich people could afford to live in houses made of stone. During the Middle Ages there was a hard time for criminals. The punishments were very tough. Capital punishments and scorching were common. If you were lucky you were only convicted to whipping or standing by the pile of shame. In very few cases you got fined, but most people didn't have money to pay them. For the people in the town it was a free entertainment to watch a criminal being punished.